As the debate over how to reduce gun violence continues in the wake of last month's deadly Parkland, Florida school shooting, new research is shedding light on the impact state laws may have on the number of gun-related deaths -- and what happens when gun control laws in one state are either stronger or weaker than their neighbors'. According to the latest statistics from the Centers for Disease Control and Prevention, there were more than 36,200 deaths from firearms in the United States in 2015, with guns killing more people than motor vehicle crashes. While mass shootings tend to garner the most media attention, on average almost 100 people die each day in the United States from gun violence, including suicides, domestic violence, accidents, and local criminal incidents. "This is a public health emergency and yet we know so little about how to prevent these injuries and death," said Elinore Kaufman, MD, one of the study authors and chief resident in surgery at NewYork-Presbyterian/Weill Cornell Medical Center in New York City. Kaufman is pursuing a career in trauma surgery and said that "there have been too many times" when she had to tell a family whose loved one had been shot that nothing could be done to bring that person back, or that a teenage child was alive but paralyzed from a bullet to the spine. She wanted to help find answers on the best ways to prevent these tragedies, so she decided to investigate the impact of state laws on gun violence. 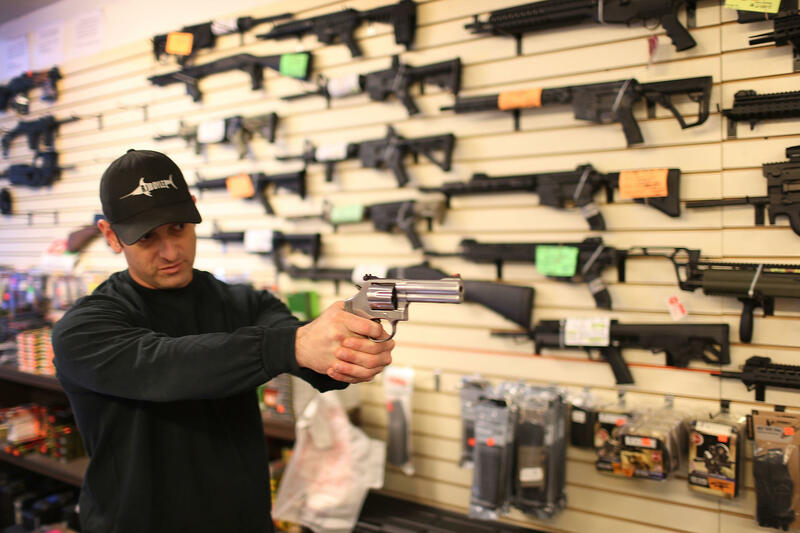 "Specifically, in the U.S. most firearm policy is made at the state level, but states do not exist in a vacuum, and firearms can cross state lines, just like any other consumer good," Kaufman told CBS News. "No one had really investigated what this means for states with different degrees of firearm restriction in place." The study, published in JAMA Internal Medicine, looks at the strength of gun laws in 48 states, as well as homicide and suicide rates in more than 3,100 counties across the country. Laws mandating strict licensing requirements or increased law enforcement oversight of gun dealers. Laws requiring background checks for private sales of firearms, including gun show sales. Laws that require individuals to obtain licenses to purchase or own firearms. Regulations setting minimum design standards for firearms, to limit the availability of inexpensive handguns. Laws restricting multiple purchases of guns, designed to prevent "straw purchasers" from buying multiple weapons on behalf of someone who cannot legally purchase a firearm. Laws requiring owners to report loss or theft of a firearm. The researchers also gave each county an interstate policy score, where a higher score meant stricter laws in nearby states. This is important because firearms can be moved so easily across state lines, presenting a challenge to states that have stronger policies in place. Counties were then divided into low, medium, and high scores. Using statistical models to compare groups of counties, the researchers found strong firearm laws in a state were associated with lower rates of firearm homicide. Conversely, counties in states with weak gun laws had the highest rates of firearm homicide. They also discovered that counties in states with weaker gun laws had lower rates of firearm homicide when surrounding states had strong gun laws. This suggests that when a state strengthens its firearms laws, both that state and its neighbors could see protective benefits. "We thought that because guns can cross state lines, counties in states with restrictive laws might have higher homicide rates if they were near other states with more lenient laws," Kaufman said. "But what we found was somewhat the opposite. Counties in states with weak laws had fewer deaths than expected when surrounding state laws were strong. "We can't say what causes this relationship," she continued, "but it is encouraging to think that these policies might have benefits that extend across state lines -- a bit of a halo effect." The authors note that the study is observational and cannot prove a cause and effect relationship between firearm laws and gun violence. The study also notes that only a few states -- mostly along the East Coast, plus Illinois, Michigan and California -- have strict laws, so the "ability to detect an effect of the strictest laws may have been limited," the authors wrote. Guns sold through the mail and internet can also make firearms equally accessible no matter where someone lives. Suicides account for nearly two-thirds of the gun deaths in the U.S. each year. About 22,000 people took their own life with a gun in 2015. When the researchers looked specifically at suicide, they found that strong firearm laws in a state were associated with lower rates of suicide by gun -- and lower suicide rates overall, suggesting that people did not just find another way to kill themselves. That was true regardless of the strength of gun laws in neighboring states. The researchers say this finding is consistent with previous research showing that most firearm suicides involve people who own a gun or a family member of a gun owner, and likely involve legally-purchased firearms obtained for other purposes. "Many suicides are impulsive, and the urge to die fades away. Firearms are a swift and lethal method of suicide with a high case-fatality rate," David Hemenway, a professor of health policy at Harvard T.H. Chan School of Public Health and director of the Harvard Injury Control Research Center, explained in a statement about another study on gun deaths published in 2016. The mass shooting at Marjory Stoneman Douglas High School in Parkland, Florida that killed 17 people propelled the debate over gun safety laws once again into the national spotlight. Students led the call for walkouts, sit-ins and other actions on school campuses across the United States aimed at pushing lawmakers to pass tougher restrictions on guns. Gun advocates, including Wayne LaPierre, the chief executive of the National Rifle Association (NRA) take the opposite approach, asserting that more armed security rather than fewer guns is the answer. However, little data actually exists to inform this debate with hard evidence about the scope of the problem and what impact various polices may have. That's because in 1996, Congress passed a law limiting the CDC's ability to study gun violence. A provision known as the Dickey Amendment, which prohibits using public health funds to "advocate or promote gun control," had a chilling effect on virtually all government research on the topic. That's why this study and others like it are so important, Kaufman says. "Injuries and deaths from gunshot wounds are a public health emergency that deserve much more attention from the public, communities, and policy makers, as well as from health care providers and researchers like myself," she said. "Our study adds one more piece of the puzzle toward preventing these deaths, but there is so much more we don't know."